Haven't You Had Enough With Body Pains That Keep You Behind? Would You Like To Relieve Sore Muscles And Overcome Injuries While Resting Comfortably In The Comfort Of Your Own Home? 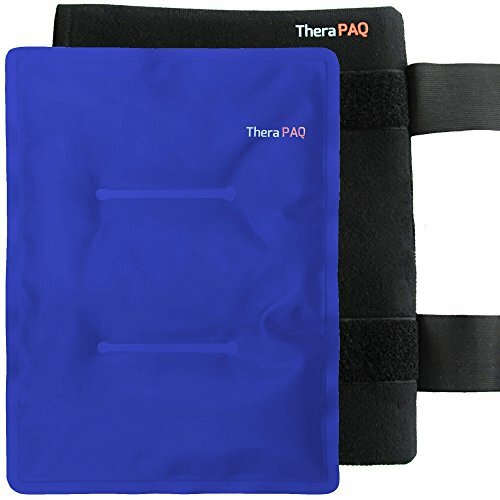 This Incredible Pain Relief Hot and Cold Pack by TheraPAQ Is Exactly What You Need! Aching knees, painful shoulders, tense muscles and injuries that take too long to heal can limit your movement range, cause great discomfort and keep you from doing your utmost. Now, you can soothe pain in an easy, incomparably effective way! All you need is the ultimate hot and cold therapy gel pack which is now available on Amazon! Whether you are suffering from aching knees, sports injuries, muscle pains, stiffness or limited movement that comes after a surgery, this ice gel pack is the answer to your problem! Choose cold or hot therapy depending on your preferences and needs. The icy cold or soothing warm gel pack will help you alleviate any pain and discomfort effectively. In addition, the extra-large size and adjustable, elastic hook-and-loop straps will provide the perfect fit, nicely hugging any body part and targeting any aching area. Knee, hip, thigh, shoulder, shins, calves and any other pain will never again stand in your way! Relief takes nothing more than a few simple steps! Just freeze it or heat the pack and place it in the wrap. Then, wrap it around the targeted body part, adjust the straps and lay back or even stay mobile! ☑️RELIEVE PAIN, ENJOY FULL MOVEMENT RANGE AND DO YOUR BEST: Whether you are an athlete, a fitness enthusiast or someone who has a busy everyday schedule, you know that injuries and body pain can be a great setback. From now on, you will be able to combat and relieve muscle pain, aching sprains, swelling, arthritis, post surgery, joint pain and injuries at the comfort of your own home! All you need is this top notch ice gel pack with wrap. ☑️ENJOY COUNTLESS POSSIBILITIES: The TheraPAQ hot and cold therapy ice gel pack can be used for many different purposes! Its size and the high quality construction allows you to wrap it around your shoulder, knee, hip, thigh, calves, shins and any other body part you wish to relieve! Just microwave or freeze as needed. ☑️PICK HOT OR COLD THERAPY AND SAY GOODBYE TO DISCOMFORT: This must have gel pack can be used both for hot and cold therapy, allowing you to pick whichever you like best! Whether you prefer to freeze pain away or soothe it with the help of the alleviating warmth, this gel pack is the perfect choice for you! Get ready to relieve pain and feel ready to seize the day. ☑️A COMPRESSION WRAP THAT WILL PERFECTLY EMBRACE YOUR BODY: Forget about small, tight therapy wraps that make you feel uncomfortable! This amazing reusable ice pack for injuries comes in a carefully designed wrap which is bound to keep you relaxed and happy while boosting the therapy pack's effectiveness. The elastic hook-and-loop straps can be easily adjusted, while the extra-large size can assure the perfect fit for any body type. ☑️ORDER NOW WITH PEACE OF MIND knowing that we have a 100% MONEY BACK GUARANTEE, NO QUESTIONS ASKED, NO CATCHES! We stand above and beyond for our customers. If you're not thrilled with your purchase for any reason, just tell us and we'll refund 100% of your purchase price - anytime! ☑️IDEAL GIFTS for Black Friday, Cyber Monday, Prime Deal Day or Christmas. If you have any questions about this product by TheraPAQ, contact us by completing and submitting the form below. If you are looking for a specif part number, please include it with your message.